The semester is back underway. I preached in Georgia earlier this week (slow sledding) and, now, in New York City for a debate. If you think about it, please pray for my debate. I have no idea what to expect, as it’s loosely organized. A bar in NYC used to hold monthly debates and the group that organized them wants to get them going again. This is the first one, so I don’t know if there will be 10 people or 100 people there. I don’t know anything about my “opponent,” aside from his Libertarian/An-Cap political views, so flying a little blind. I can’t imagine there being anything new under the sun. It should be recorded, so it should be posted on YouTube. May I make Him clearly known. 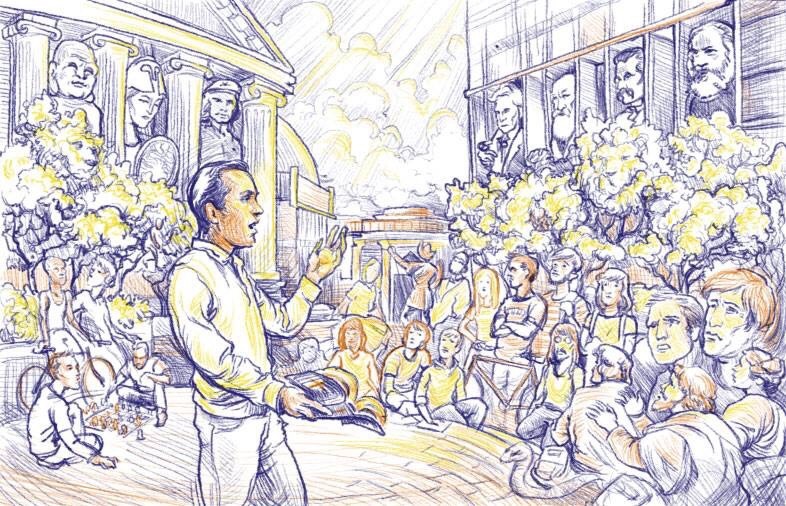 The sketch above was done about 8 years ago when I left AmEx to preach. It’s a spin on Raphael’s “Paul in Athens.” As the semester gets underway, that’s still the goal and what I’m attempting to do. 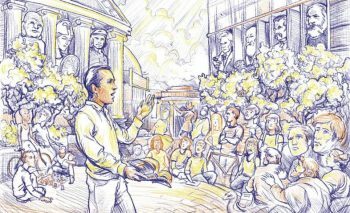 Engage Marx, Buddha, Darwin, etc., and change the allegiance of their disciples to Jesus.